Oscar Grant's story is true. It's true and it's horrifying. 22 years old, murdered at a train station by a police officer, the very person you expect to protect and serve. A person you want to believe you can trust. 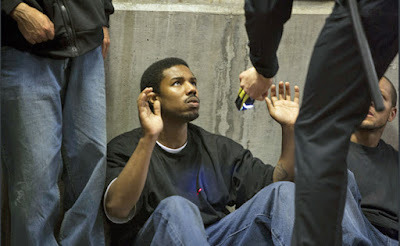 Surrounded by witnesses, some filming with their phones, Oscar Grant was shot in the back and left to die. His story is true and it deserves to be told and it should be embraced by anyone who wants to stand up against injustice. It should be admired by anyone who gets excited by fine filmmaking. It should haunt anyone who finds discomfort in the far too real fragility of life. 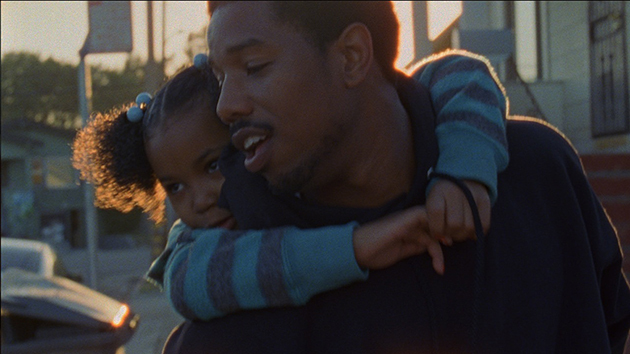 Ryan Coogler does a terrific job of directing the film Fruitvale Station with a simplistic hand, allowing the actors and the events of one single day to carry along the story, and he gets everything possible from actors like Michael B Jordan as Oscar, Melonie Diaz as his girlfriend Sophina and Octavia Spencer as Oscar's mother. I have read some feedback prior to my viewing that complained that the film meandered along without much plot and also went over the top to emotionally manipulate the audience, but I completely disagree with both assessments. As we follow Oscar through the last day of his life, I don't see any single moment that occurred as meaningless. The simple moments of life, like brushing your daughters teeth or sitting down and eating dinner with your family, are often fleeting and unappreciated, but that is what life is all about. Today could be the last day of my life. There is no guarantee I will see tomorrow, an unfortunate truth that people never seem to pay much regard to, but it's a fact that allows me to appreciate each moment much more than I used to. Every hug could be my last, every kiss, every chance to say I love you. My daughter has asked me not to leave the house, much like a scene in the film between Oscar and his daughter, so I choose not to look at that as emotional manipulation by a filmmaker. I have lived it, and if something were to happen to me that day it would be a heartbreaking coincidence. The power of the film is not just in the tragic ending, but in the small, simple moments. Every part of his day is tragic because we know watching it that he will never get a chance to do those things again. 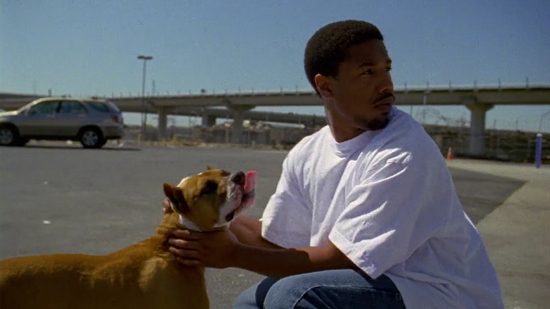 I especially appreciated a scene that might seem unnecessary in which Oscar consoles a dying dog that had just been run over by a car, but in fact that sequence was rich from some pretty powerful symbolism. Most people look at a pitbull and fear it as something angry, something that can hurt them, despite not taking the time to actually learn if the dog is in fact warm, gentle and friendly, which reminds me an awful lot of the way many still view the African American community even to this day. Much like the pitbull, Oscar Grant was needlessly killed that night and was left to die, lying alone, scared and in pain. It's sad I had to ever see this film because it's existence means the crime had to occur in the first place, but at least a beautifully crafted, honorable work was created to tell his story. This is just one of too many stories of police overreaction. Was Oscar the perfect person? No. Did he deserve to get shot and killed? Hell No!! Almost 400 people have been shot and killed by police so far this year (and it isn't even half over), while other countries have virtually none (Great Britain had none last year, Germany eight in past two years, and Canada averages about 12 a year). OK, off my soapbox. I loved the movie. Simple and not flashy. Just a story of a person trying to get on the right track in life and its tragic end. Feel free to jump on that soapbox anytime you wish Nathan. I am right there with you, word for word. I always see these comments online about how some of these victims were criminals and thus they "deserved it" and it makes me sick. People aren't perfect, but that doesn't make their murders justified in any way. Horrifying. Glad you loved Fruitvale, simple and not flashy is spot on.